The fall set, the first set in new blocks, is al­ways an im­por­tant pe­ri­od for Magic: The Gathering. Kaladesh seems all the more im­por­tant as it is part of the first block set on a brand new plane since Khans of Tarkir, and comes at a time of many prod­uct changes and tweaks. A lot of weight rests on the shoul­ders of this arte­fact fo­cused set. So does Kaladesh de­liv­er? Well to an­swer that ques­tion we will, as al­ways, look at the dif­fer­ent el­e­ments of the set and see how well it meets the nu­mer­ous de­mands of a mod­ern Magic: The Gathering set. We dis­cussed the world of Kaladesh, as well as its new me­chan­ics, in our pre­view of the set. So if you are un­fa­mil­iar with those I would rec­om­mend read­ing that pre­view first. The first thing I no­ticed when play­ing in my pre­re­lease is Kaladesh has less rigid ar­che­types, and more of a ba­sis in broad­er syn­er­gies. Some sets place you into very clear­ly de­fined strate­gies and deck types. You build your deck by as­sem­bling the most pieces of that ar­che­type as pos­si­ble to win. Other sets al­low you to build more flex­i­bly, and don’t guide you to­wards cer­tain decks. Kaladesh is the lat­ter, al­low­ing you to mix and match the me­chan­ics whilst still hav­ing a playable deck. This is part­ly due to the preva­lence of colour­less cards; many use­ful com­mons and un­com­mon can fit in al­most any deck. One of the big pow­er­hous­es I saw at my event, and one I’ve heard mul­ti­ple peo­ple talk­ing about, was Key to the City. It re­al­ly al­lows you to push dam­age through in the late game, and pro­vides ef­fec­tive deck fil­ter­ing. In grindy match­es look out for this card as a way to break the stale­mate. The colour­less ve­hi­cles are a big part of this. Vehicles are great fun in al­most any Kaladesh Limited deck, and add uses for out­classed crea­tures lat­er in the game that al­low them to crew ve­hi­cles. After play­ing with them hands‐on what I can tell you is the cost to crew a ve­hi­cle makes a big dif­fer­ence to its playa­bil­i­ty — some­times over and above the ba­sic mana cost. Vehicles that cost more than three to crew can be dead‐drops onto an un­de­vel­oped board. The dif­fer­ence be­tween hav­ing to tap three pow­er to crew and five pow­er to crew is as­tro­nom­i­cal in prac­tice. 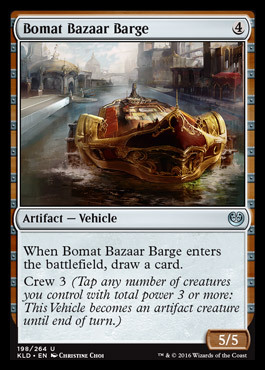 Demolition Stomper looks flashy with its ten pow­er, but hav­ing to crew for five makes it vast­ly in­fe­ri­or to a card like Bomat Bazaar Barge (which is also very fun). My main ad­vice for Limited would be to pay at­ten­tion to fab­ri­cate cards. There are a lot of strong uses for them, and they ap­pear in every colour. Fabricate gives you op­tions. Marionette Master looks ex­pen­sive and clunky, but the op­tion to make ei­ther a 4/6 crea­ture that makes your op­po­nent lose four life when an arte­fact is out into a grave­yard or give you up to three ex­tra po­ten­tial block­ers that each make your op­po­nent lose one to three life when they die is very pow­er­ful. Being able to go wide and clog up the ground or go tall and punch through us­ing the same card is an ab­solute bless­ing. The bomb rares in the set gen­er­al­ly fit in most decks run­ning their colour. There are cards that utilise syn­er­gy, but most of the strong pulls are good in iso­la­tion and just work bet­ter in an op­ti­mal deck. 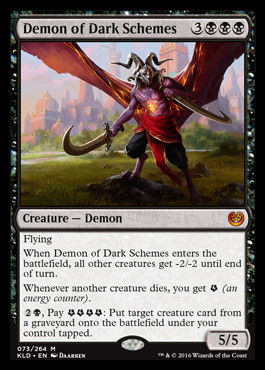 Angel of Invention is an ul­tra pow­er­ful card, and Demon of Dark schemes is its own en­gine when it comes to en­er­gy. But both ex­cel in a shell that sup­ports them. This type of syn­er­gy with a ba­sic pow­er lev­el is one of the run­ning themes of the set, with a good ex­am­ple be­ing how most en­er­gy crea­tures work. Energy crea­tures most of­ten func­tion just fine in iso­la­tion. They give en­er­gy as they en­ter the bat­tle­field that can fuel their abil­i­ty once or twice. Support makes these crea­tures even bet­ter. A deck with a strong en­er­gy theme al­lows mul­ti­ple pos­si­ble ac­ti­va­tions. This is a good bit of de­sign as en­er­gy crea­tures don’t feel like a dead draw now if you’re not on an en­er­gy strat­e­gy. The ex­cep­tion I would make to this are the very en­er­gy de­pen­dant sta­t­ic arte­facts such as Fabrication Module. To play cards that are only use­ful in ei­ther gen­er­at­ing or util­is­ing en­er­gy does re­quire you to go all in on an en­er­gy heavy deck. The best thing I can say about Kaladesh Limited is it feels fun to play. That’s re­al­ly all I want out of a Limited en­vi­ron­ment. It plays well in sealed and the cou­ple of drafts I’ve been able to have of it felt bal­anced, there isn’t a sin­gle deck every­one is rush­ing to make — at least not yet. We’ll have a more de­tailed look here when we reach the sec­tion about Eternal for­mats, but Chandra, Torch of Defiance is un­doubt­ed­ly the card in the set every­one is look­ing at for Standard. Her high pow­er lev­el makes her a safe bet. If peo­ple can fig­ure out a de­cent shell to put her in then you’re go­ing to win with her and lose to her. Aether Hub is an un­com­mon with its eyes firm­ly on Standard as well. It’s a colour­less mana source, which should nev­er be over­looked with Eldrazi still around, and in any deck that can re­li­ably cre­ate en­er­gy it’s a great source of fix­ing. 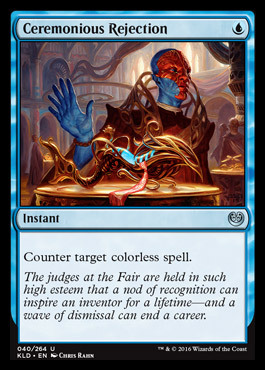 It’s not flashy, but I ex­pect it to be one of the most con­sis­tent sta­ples in the Kaladesh Standard sea­son. The biggest picks every­one are talk­ing about for Standard, out­side the Planeswalkers, are the Gearhulks. Everyone is com­par­ing these to the in­fa­mous Titan cy­cle first seen in the Magic 2011 core set. 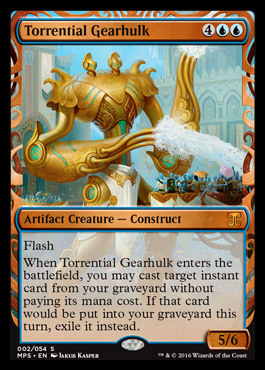 I don’t think they’re any­where near as pow­er­ful due to them not trig­ger­ing when they at­tack but they’re still plen­ty pow­er­ful, es­pe­cial­ly Verdurous Gearhulk who comes in with an ef­fec­tive eight pow­er and tough­ness that can be spread across mul­ti­ple crea­tures for just five mana. 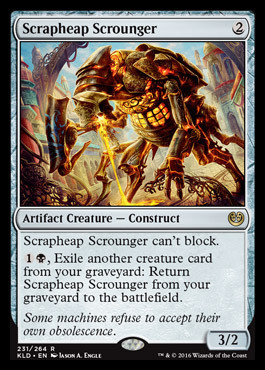 Outside of the Gearhulks, I think ef­fi­cient colour­less crea­tures like Filigree Familiar, which has so much val­ue due to its card draw and Scrapheap Scrounger, with its per­sis­tence, will find a home in Standard to do their ease of cast­ing. Fumigate is look­ing like the board‐wipe of choice go­ing for­ward as it gives life‐gain to con­trol decks that helps them over­come ag­gro builds. This is es­pe­cial­ly rel­e­vant due to the amount of ser­vo to­kens and “go­ing wide” strate­gies Kaladesh en­cour­ages. 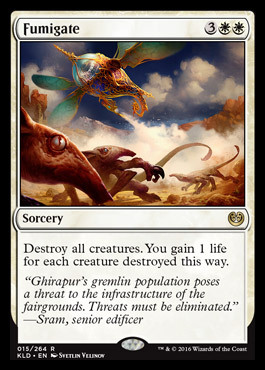 The re­cent Star City Open, one of the first big events to test Kaladesh be­fore the pro‐tour, yield­ed a some­what sur­pris­ing break­out card in Smuggler’s Copter. The card al­ways had a lot of Standard po­ten­tial, but the sur­prise is that it was be­ing played as a full play­set in so many top eight decks. Making waves as well is Pia Nalaar, who we cov­ered in our pre­view of the set be­cause of her sweet lore/flavour as­pects. My cau­tion on run­ning out and buy­ing cards is this: the metagame takes time to shake it­self out. Over the course of a sea­son things shift rapid­ly so I ex­pect some cards to gain in rel­e­vance and oth­ers to drop away, as is the norm. 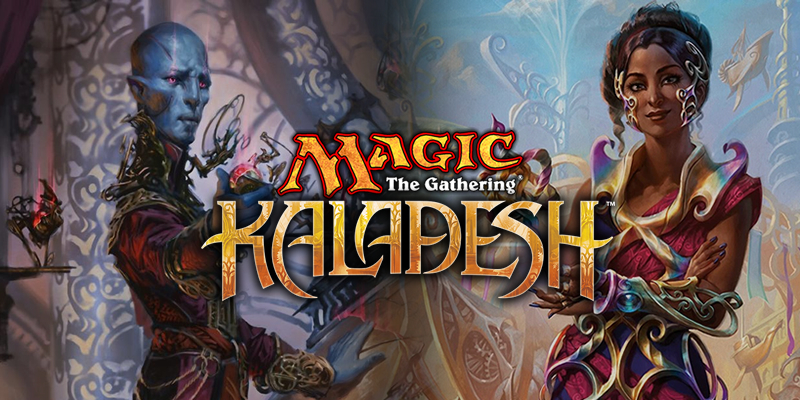 As a large set should, Kaladesh is al­ready hav­ing a big im­pact on Standard. It has a de­cent power‐level and some in­ter­est­ing syn­er­gy to ex­ploit. I look for­ward to some of the more crazy rouge decks peo­ple will build. 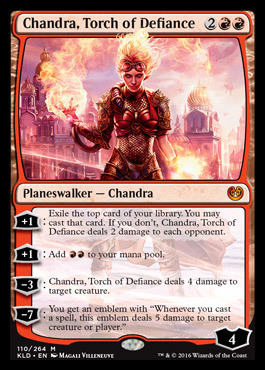 Chandra, Torch of Defiance – She’s de­lib­er­ate­ly pushed. She has four abil­i­ties and those abil­i­ties are pushed com­pared to her ear­li­er ver­sions. Her ul­ti­mate is doable and she comes out right on curve with four loy­al­ty. You don’t need me to tell you Chandra is good. She’s the chase myth­ic for the set and will like­ly see Modern play. 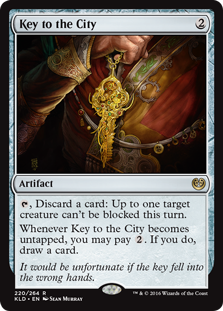 Ceremonious Rejection – This card will see side­board play in Modern, and even Legacy, un­til the end of time. It’s the per­fect an­swer to decks like Affinity, Eldrazi, or any deck that runs a high num­ber of colour­less spells or has a colour­less com­bo piece. I re­al­ly like ef­fi­cient scalpel cards like this that have a laser fo­cused use in a va­ri­ety of for­mats. Madcap Experiment – The new Possibility Storm. I ex­pect this card to have a deck build around it that only works 50% of the time, and a build every­one im­me­di­ate­ly learns how to deal with. 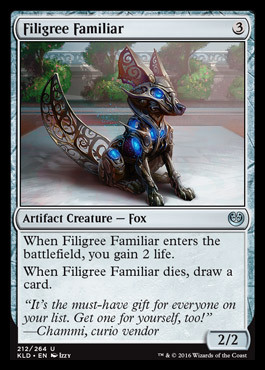 I know this card looks ex­cit­ing and cool, but there isn’t go­ing to be a deck built around it in Eternal for­mats that sticks around. I’m sor­ry. Fast Lands – Wizards of the Coast is on a roll when it comes to com­plet­ing cy­cles. 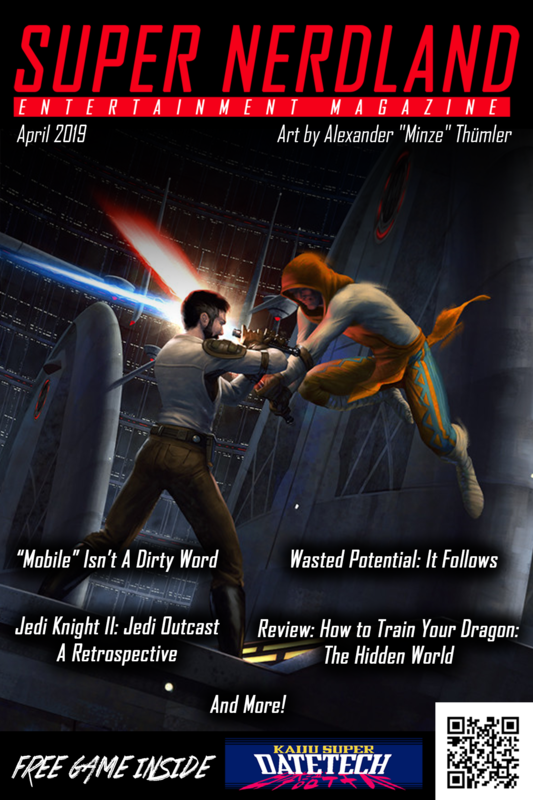 This time print­ing the en­e­my coloured ver­sion of the Fast Lands last seen in Scars of Mirrodin. Fast Lands are named as such be­cause they’re meant to of­fer quick colour fix­ing when you have few lands on the bat­tle­field — they’re at op­ti­mum util­i­ty in the ear­ly turns of the game. The blue/red fast land Spirebluff Canal is the most de­sir­able land due to its util­i­ty in mul­ti­ple decks that need fast fix­ing in those colours. Botanical Sanctum is the least de­sir­able due to it be­ing awk­ward in the colour com­bi­na­tions that would want it. All of the en­e­my coloured Fast Lands will see at least fringe play in Modern decks, and may go back as far as Legacy. 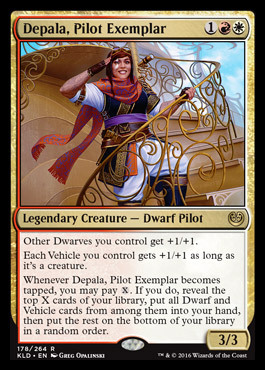 In Commander we have an un­ex­pect­ed Dwarf and Vehicle trib­al leader in the form of Depala, Pilot Exemplar. I love get­ting these ran­dom lit­tle trib­al gen­er­als in sets and just know I will be mak­ing a ca­su­al vehicles/dwarfs deck just to play with her. 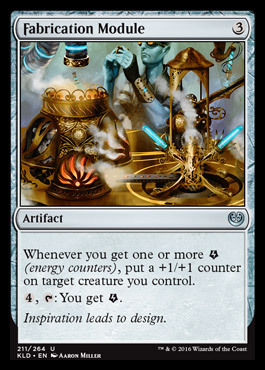 The big, janky myth­ic every brew­er is go­ing to try and make work is Aetherworks Marvel, a hi­lar­i­ous card if you can stack the stop cards of your deck right. Makes me even more sad Emrakul, The Aeons Torn is banned in the of­fi­cial ver­sion of the for­mat. 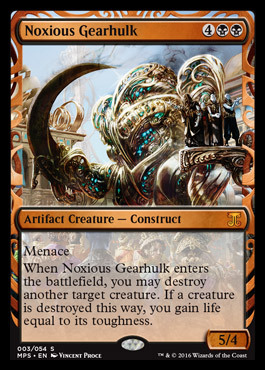 Some are spec­u­lat­ing that the Gearhulk cy­cle has what it takes to see play in Modern. Whilst I think it will cer­tain­ly see test­ing, much of the hype for these cards is due to the afore­men­tioned mis­placed Titan com­par­i­son. I don’t ex­pect any of the Gearhulks to see wide­spread Modern play. How much value is in Kaladesh? 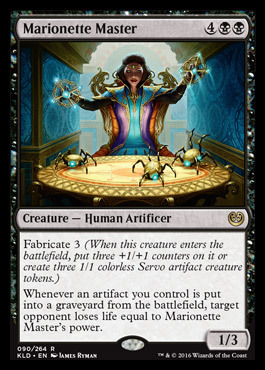 At this point we need to ad­dress the ele­phant in the room; the fact that ex­pe­di­tions are back in the form of the Masterpiece Series, which for its first of­fi­cial out­ing fea­tures the Kaladesh Inventions. The Masterpiece Series, much like the Zendikar ex­pe­di­tions, are only a fac­tor if you’re open­ing large amounts of prod­uct. 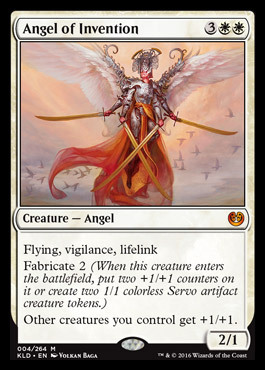 They do add val­ue over a large scale in the set, but they are also high vari­ance, only be­ing seen in about 1/144 packs. 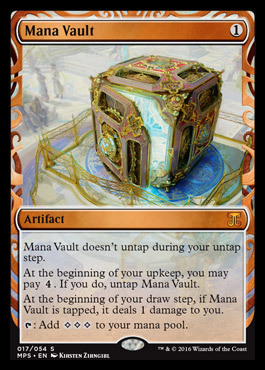 Masterpieces ex­ist not on the scale of boost­er box­es but of boost­er cas­es, so your chance of open­ing one and see­ing $200 cards like Mana Crypt, is in­cred­i­bly slim. 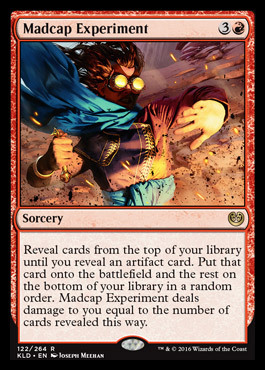 We live in an age of Magic: The Gathering where sets are de­signed to have a one or two high pow­ered cards from the set that hold most of the val­ue, and a se­lec­tion of re‐printed cards above Mythic rar­i­ty that tech­ni­cal­ly aren’t in the set that serve as a car­rot to open packs. You’re al­ways chas­ing a slim num­ber of big hits. This is Wizard of the Coast’s stan­dard way of struc­tur­ing block‐sets mov­ing for­ward. They’re more than hap­py to take the lot­tery tick­et ap­proach to mar­ket­ing sets, and the amount of prod­uct be­ing opened would seem to con­firm that — at least in the short term. 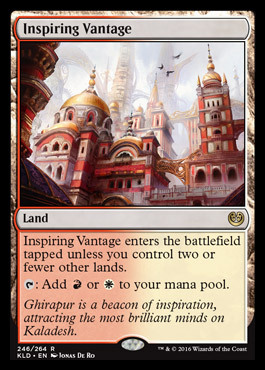 This has both pros and cons, but in terms of Kaladesh this means you should al­ways be look­ing at the av­er­age val­ue of packs and not the slim chance of open­ing an Invention. With the print lev­els and amounts of this set ex­pect­ed to be opened, most of the rares and even mythics will main­tain a price well be­low the $10 mark with the price of Standard be­ing dri­ven most­ly by Chandra and the oth­er Planeswalkers. Exceptions take place when cards like Smuggler’s Copter break out in Standard, but if we see a high lev­el of va­ri­ety in Standard decks over the medi­um term, then ex­pect the prices of cards see­ing even de­cent play in Standard not to rise above the $5 mark. The only cards I would class as a safe bet for long‐term in­vest­ment are the Fast Lands as they won’t go up rapid­ly or dra­mat­i­cal­ly, but over the long term they are the safest place to in­vest. Pick them up if you see them cheap. Overall I think Kaladesh is a good set, and a very fun set com­pared to what we’ve had in the last cou­ple of blocks. Vehicles are as fun to play Limited as in Casual, as I thought they were go­ing to be, and the set uses a unique aes­thet­ic and fla­vor. I es­pe­cial­ly en­joy the way the Limited en­vi­ron­ment plays out — with lots of op­tions for decks and flex­i­ble colour­less cards. It’s an arte­fact set where you can feel the theme with­out every­thing and every­one hav­ing to be an arte­fact. 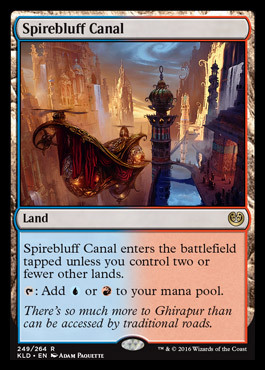 Yet Kaladesh oc­cu­pies an odd spot. The set will have an im­pact on Standard, but rares in the set will have a rel­a­tive­ly low val­ue. This is the price we pay for mod­ern print lev­els, and to play­ers like me who most­ly just buy sin­gles that isn’t much of a price at all. Cheaper Standard is, in my eyes, a good thing. I pre­vi­ous chid­ed Battle for Zendikar for its low card val­ue, es­pe­cial­ly post‐Modern ban, but that was due to a per­fect storm of lack­lus­tre im­pact on Standard, and mas­sive print/opening lev­els. I’m also quite thank­ful that Chandra hasn’t yet been in a full play­set for a lot of the top decks yet, be­cause that would ren­der hav­ing cheap­er to get hold of Standard playable cards al­most moot with her mas­sive price tag. Unlike pre­vi­ous block sets, I have a lot to say about Kaladesh – and that’s a good thing. It ex­cites me with its world and its pos­si­bil­i­ties. The last cou­ple of blocks had ranged from “sat­is­fac­to­ry” to “what the heck is this crap? 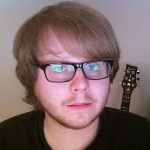 !” All whilst tread­ing fa­mil­iar ground in both the set­tings and their me­chan­ics. If I wasn’t writ­ing about them and analysing the game I hon­est­ly would have skipped Battle for Zendikar and Shadows over Innistrad – such was my in­dif­fer­ence to­wards them. 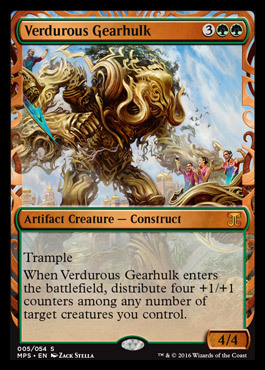 Thankfully, Kaladesh has rekin­dled my in­ter­est in blocks. 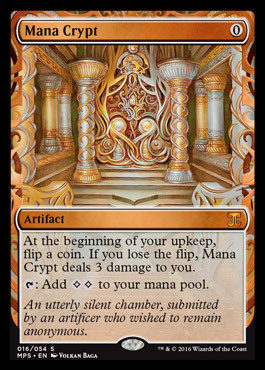 The only real com­plaint I have about the set is that Wizards of the Coast con­tin­ues to make odd and very ba­sic mis­takes with their print­ing. 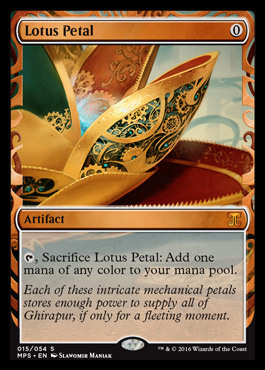 This time around whole­sale for­get­ting to print any en­er­gy to­kens in the first run of Kaladesh, then hasti­ly get­ting play­ers to print their own for pre‐release. Coupled with talk of print trou­ble and dam­aged cards in re­cent sets I feel I have to add this caveat to my re­view. Wizards of the Coast is hav­ing some qual­i­ty con­trol is­sues cur­rent­ly, so bear that in mind when buy­ing any new Magic: The Gathering prod­uct.